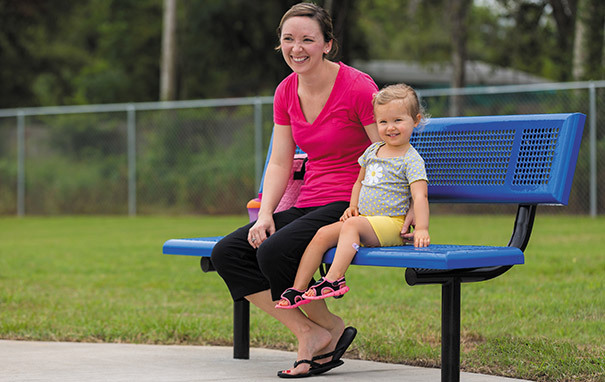 These perforated steel park benches are a classic design with bold, 2-3/8"O.D. steel tube frames and perforated steel seating surfaces. Welded and crafted to precision, these basic perforated steel benches are very versatile with almost unlimited site applications. The smooth rolled edge design provides additional comfort, safety and modern appeal. Fast to dry, for maximum guest enjoyment time, the perforated pattern keeps the bench seat safe from retaining liquids. The bench seat and back are seal coated in an impact and UV stabilized polyethylene and the frame is finished in a durable powder-coating—this bench will continue to look and perform well over the years. The 6' and 8' steel benches is available in portable, in-ground, surface or wall mounted options.